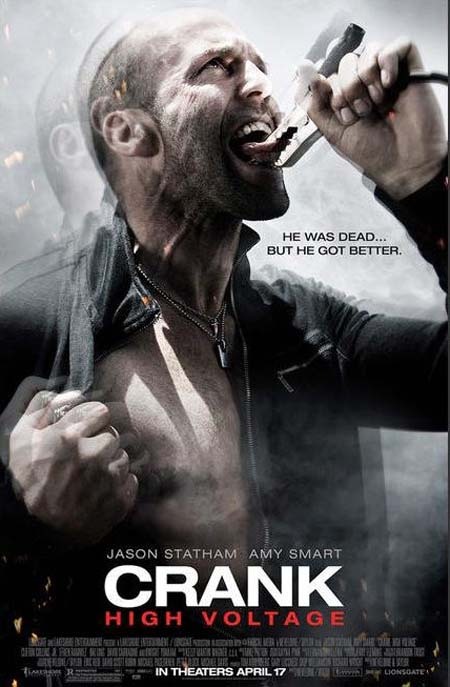 Crank 2 – High Voltage (2009). ‘Crank’ was a hugely successful and unexpected film in 2006. People thought – if you put Jason Stratham in another action film playing lead, it’s going to be horrible to watch. But shockingly, with both fast paced action and a insane storyline, it was considered by critics to be a new sort of film which had never been seen before: something daring, and something ridiculous in nature. ‘Crank 2: High Voltage’ merely capitalises on the success of it’s predecessor. In short, it’s mostly the same enjoyable thrill ride from before, except in this one there’s a cameo from the late David Carradine. The storyline follows on three months later from the events of the original, where Chev Chelios (played by Stratham) wakes up in a hospital to find out that the heart everyone thought was ‘indestructible’ has been taken from his body by the Chinese and replaced by an artificial one which needs to have electricity pumped through it to keep him alive. Yeah. Even in 2009 they’re still thinking up clever storylines. The whole series is just generally insane. The creators obviously don’t try and pull any punches or try and educate you. It’s just mindless A-Z randomness all in the name of film. All done with violent screaming by Stratham that makes Ross Kemp look like a really nice guy. Oh and we do get lovely shots of Smart half naked, although why this has been thought of as good character development I have no idea. It’s a decent film, although hard to really give it a good review in terms of the acting and special effects. It’s what you’d expect from a hybrid cross between a Tarintino film and Rush Hour. Cleverly thought up, and cleverly executed. Although it can be considered homophobic, racist, sexist and completely vulgar in places, it’s one of those unforgettable films. Seriously – suspend your disbelief and you’ll be fine.